Netofa Winery was founded in 2007, when it began manufacturing elegant, high quality wines in the old-world fashion. Netofa’s wines boast a delicate body and are defined by complex fragrances and tastes. We chose a unique branding approach while taking into account Netofa’s design and logo. The outcome produced an unassuming, pioneering, modern yet classic design, that we hoped would speak to the heart of Netofa’s target audience: secular and religious populations in Israel, Europe and the United States. The font we used was full yet hollow and did justice to the unorthodox merging of English letters with Hebrew vowels that we employed. For the slogan line, which describes the winery and its geographic region, we chose a more personal font. The language we chose combines light with color to highlight the natural connection between art and wine. While designing the wine label, we decided that each of the winery’s three series would have its own visual language based on a leading illustration, unique color and a matching font. For the first series, “Domaine’, the label design was driven by a connection to the physical landscape of the winery itself, while the coloring was determined by the color of the wine inside it. Yellow, orange-pink and red in accordance with the different types of wine in the series: white, rose and red. The label is based on wine paper with flourishes of gold at precise points in the logo and the illustration. 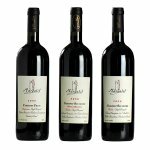 In the second series, Tel Qasset, the label design was focused on an actual person – the winemaker himself. We used an illustration of the winemaker drinking coffee while resting during the harvest to illustrate the human element in the manufacturing process. Here we used wine paper with a yellowish, almost mustard-like coloring. The illustration and design were done in black and we used a bold font for the brand name. La Tour, the third series, is the winery’s flagship product. The design approach was based on a lookout tower on the Netofa property. The label is wine paper, with a bold silver foil on the brand name and at a specific point on the logo. The label design for Netofa’s port, Ruby, is characterized by a rendering of the logo’s font into Hebrew. The font works well in both languages. The label is black while the letters are white to form a strong contrast that highlights the brand.